Incase you missed it, here’s a snippet!! 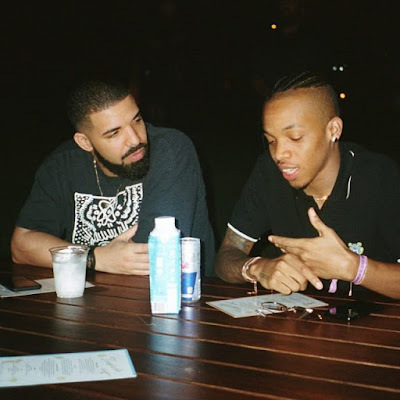 Yesterday, The Canadian Rapper shared a picture of Nigerian Singer, Tekno in his Studio cooking up some beats for him and the Nigerian MEDIA went agog in anticipation for a new collaboration or getting to work together . Some social media users however started throwing subtle shades at a certain Nigerian act who collaborated with Drake on some hit songs but there was no picture proof of them working together. Now the main gist is that Davido, who recently won yet another award has reacted to the news and he had nothing but joy and love for Alhaji Tekno. TEKNO!!! TEKNO!! u deserve am die!!!! For the culture!! 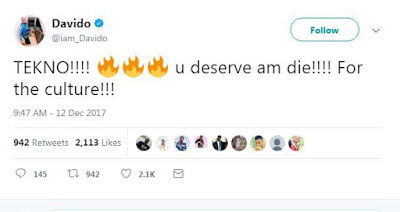 !u deserve am die!!!! For the culture!! !